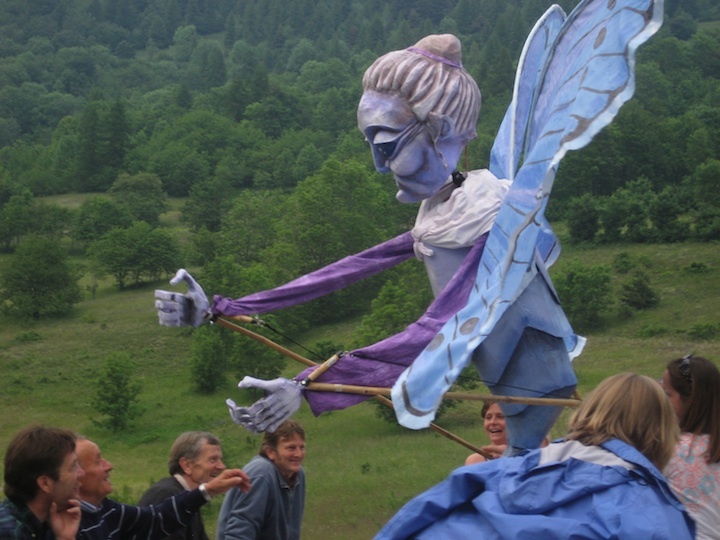 Join us for week-long workshop in pageant puppetry, culminating in a Midsummer Procession of giant puppets and other visual elements. 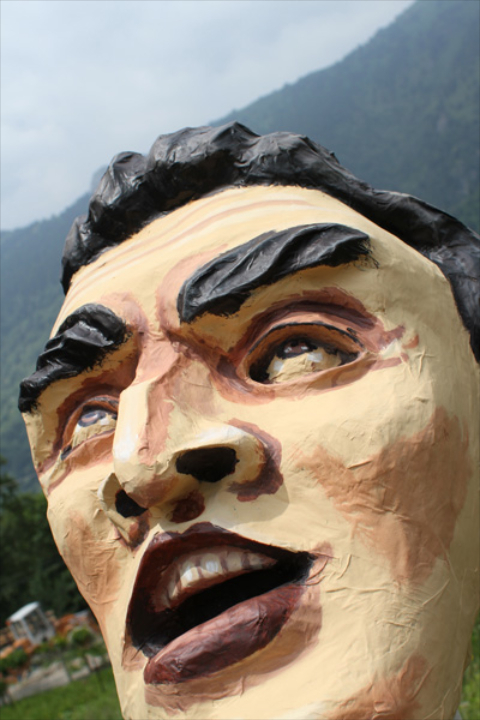 Collaborate with international participants and local residents to build on a event that evokes the seasonal rites of the Solstice and the Feast of San Giovanni Battista, in a remote village in the Occitan region of the Italian Alps. Master puppeteers Alex Kahn and Sophia Michahelles will guide you through the production of the Pageant. 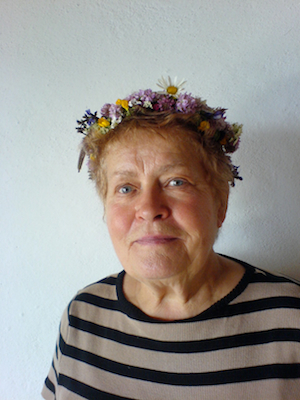 Drawing on the oral histories, agrarian rituals, folk tales, and ecology of this under-explored corner of Italy, you will collaborate with local villagers to create an evening Procession of Lights and a Midsummer Pageant the following day. 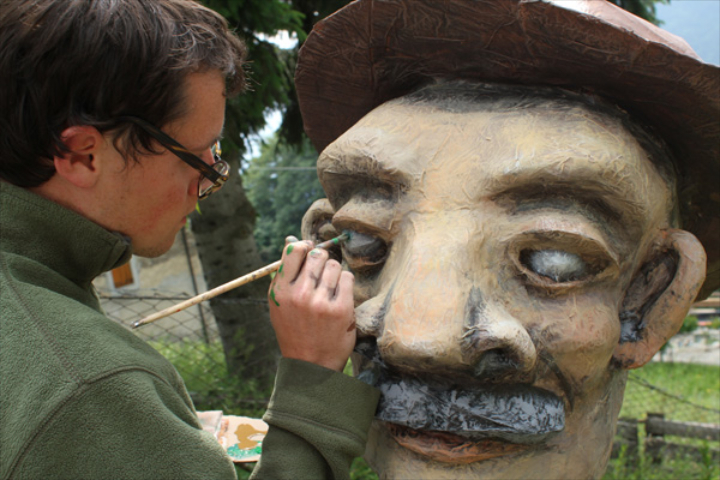 You will learn, through hands-on experience, how to construct and animate giant puppets, performing objects, banners, lanterns and ceremonial architecture. Daily workshop sessions are complimented by trips to nearby Medieval churches and cheese kitchens, an Occitan step-dancing lesson, and other unpredictable wonders. 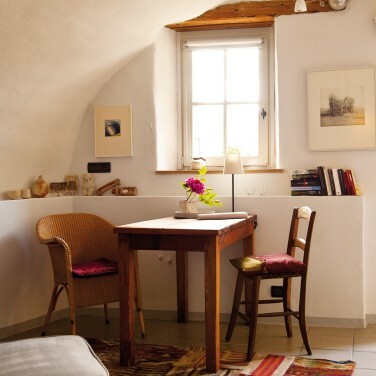 The workshop is hosted byChrista and Fritz Gaebler at Casa dei Fiori, an authentically restored complex of traditional stone houses. Christa, a world-class gourmet chef, will introduce participants to the tastes of early Italian summer, through elaborate communal meals with ingredients fresh from the garden. 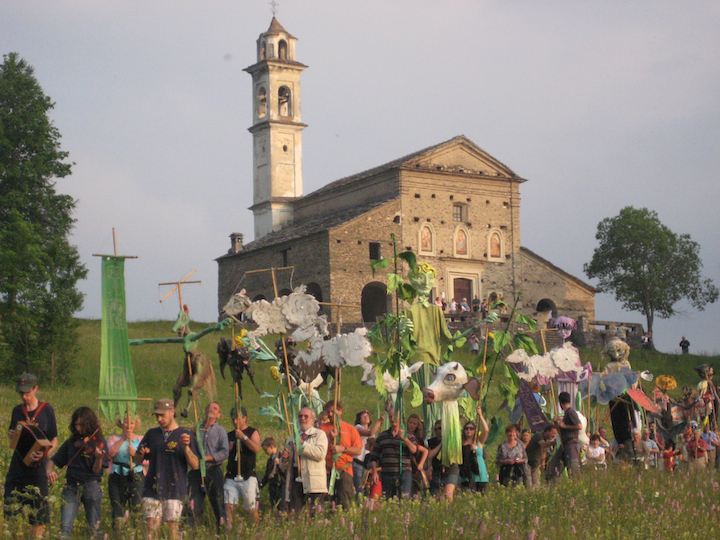 Started in 2002, the Pageant was initially inspired by rural Solstice traditions – celebrated in Italy as the Feast of St John the Baptist – an important seasonal turning marked in various locales with bonfires, household rituals and other observances. The workshop now integrates the Midsummer spirit with an evolving array of images and characters drawn from ongoing dialogues with villagers that range from obscure folk myths to the personal narratives recounting the hard realities of agrarian life. Each year, it is up to workshop participants to give physical form and action to a new chapter of an unfolding story. Alex and Sophia specialize in creating lightweight but large-scale structures from recycled and non-toxic materials, most of which are sourced locally. 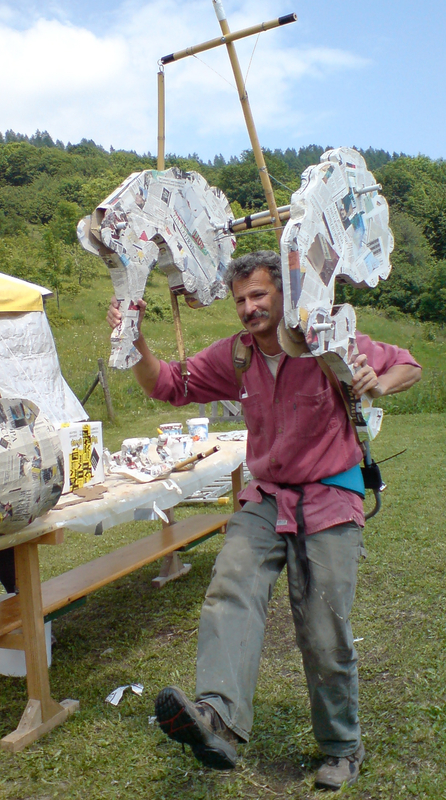 The course covers fundamental techniques in bamboo armature construction, papier-mache casting, illuminated structures, rigging and articulation, scenic painting, and other techniques as needed. The course also explores broader aspects of processional performance, such as choreography, movement and character animation. 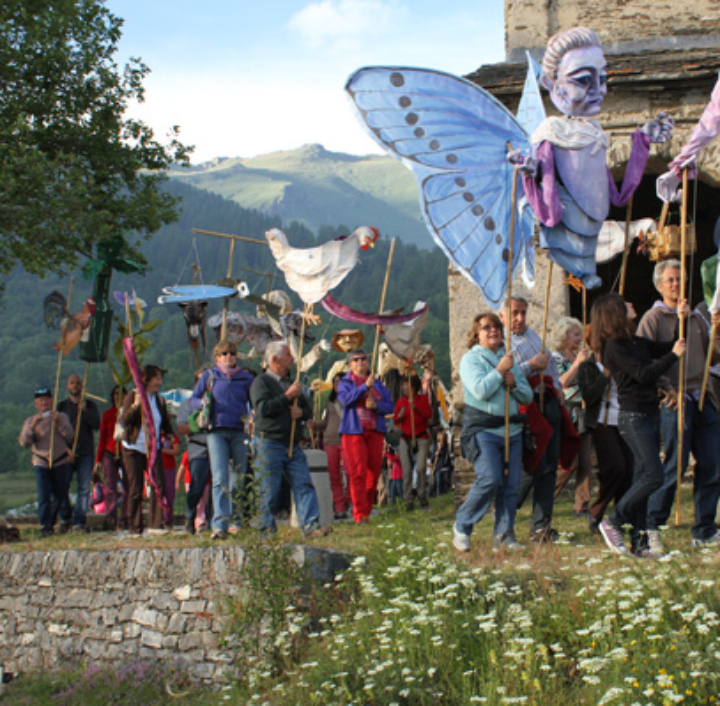 Participants work together - often alongside local villagers - to create elements for two separate processions: a night-time Procession of Light, and the Midsummer Pageant the following day. The Procession of Light is an intimate and serene procession to the cliffside Church of Santa Maria, illuminated entirely by hand-made lanterns. 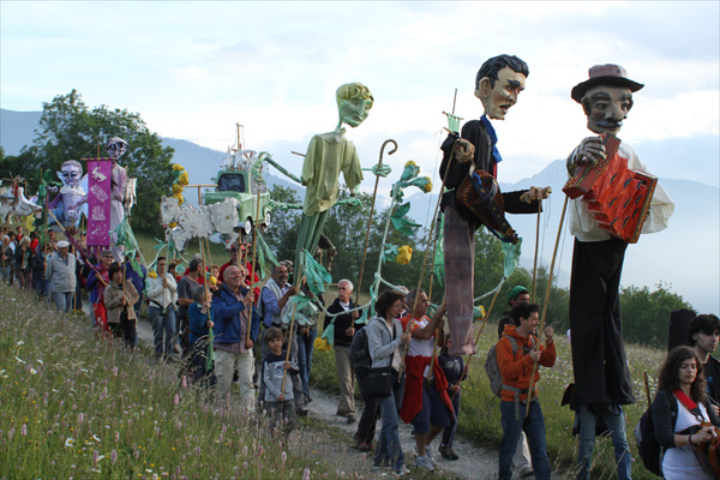 The Midsummer Pageant on the following afternoon is a more open and raucus event, as the giant puppets are brought to life by their makers and hundreds of local residents, moving in step to the rhythms of local Occitan music. We end, as all Italian rituals must, with a sumptuous feast, followed by dancing long into the night. 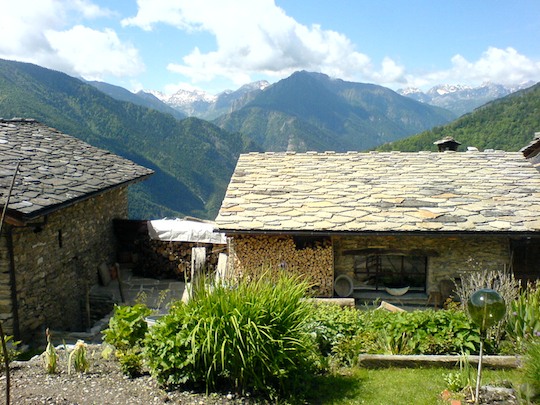 Morinesio lies nestled high in the mountains bordering France and Italy. Although only two hours from Turin, the village of Morinesio seems removed from the world. From an altitude of 4500 feet (1450 m) it offers spectacular views of the surrounding mountains and the Val Maira valley, one of the wildest of the Piedmont region, virtually untouched by large-scale development. 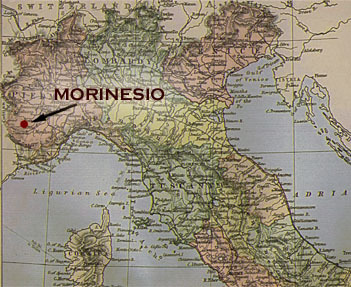 Morinesio is in one of the few pockets of Occitan in Italy. The Occitan language, linked to Langue d’Oc in France and Catalan in Spain, is the oldest written Romance language, predating both French and Italian. It was used by the troubadours for their lyric poetry from the 11th to the 13th centuries, after which it was repressed by the northern political powers. Occitan culture and language are now experiencing a resurgence, taking new root in local schools, cultural programs and among a new generation of local musicians, in whom the legacy of the troubadours lives on. Morinesio reached its peak population of about 200 around 1900. Life was primarily subsistence farming and herding, supplemented by seasonal migrant work in the violet fields of France or selling anchovies on the road from Genoa. When the first paved roads to the village were built in the 1960s, Morinesio's families abandoned the hardscrabble agrarian life for the secure and stable jobs in the factories of Turin and the commerce of Cuneo. By late 1980s, only six year-round residents remained, and Morinesio almost befell the same fate as other ghost towns on the slopes of the Val Maira. 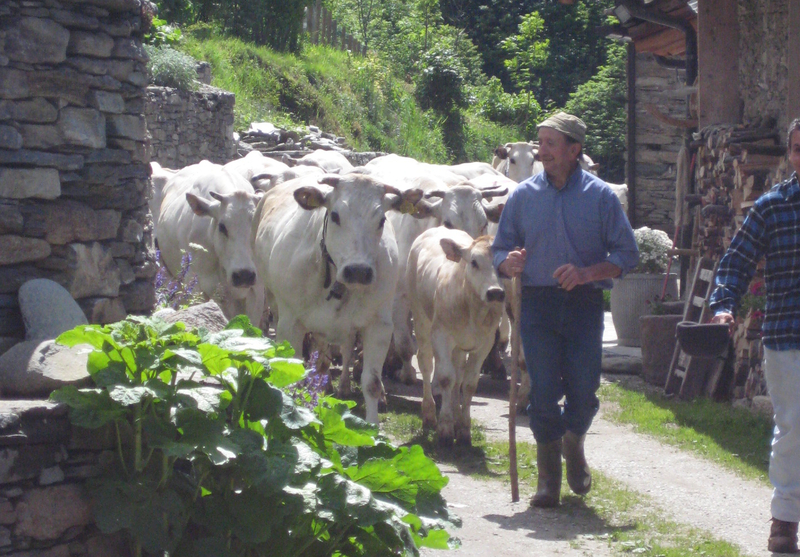 Recent years, however, have witnessed a renewed interest in preserving Morinesio's history, as the children of some families have returned to their roots, restoring old stone strucutres, taking up herding and farming, and helping revitalize local Occitan language, music, and material culture. Festivals have played an integral role in the region's resurgance, and the Midsummer Pageant has provded a means to preserve and animate the fragile narratives of Morinesio's 1000-year history. Alex Kahn and Sophia Michahelles (workshop instructors) are founding directors of Processional Arts Workshop, a non-profit ensemble of puppeteers, musicians, artists, and choreographers whose mission is to create site-specific community-built parades, processions, and performances. 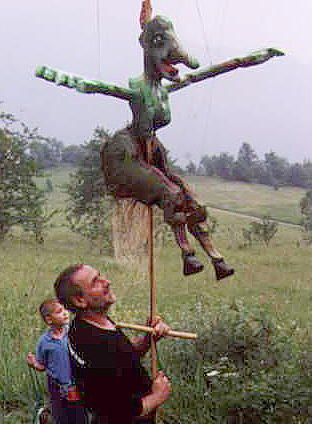 They design and build the annual performances that lead New York's famed Village Halloween Parade, and have also created works for New York's High Line, the PEN World Voices Festival, and Trinidad Carnival (on a Fulbright fellowship), as well as many other site-specific events in communities worldwide ranging from Katonah to Kiev. They have lectured or led workshops on processional art at University of Michigan, The New School, Columbia University, Bard College, and Maine College of Art. 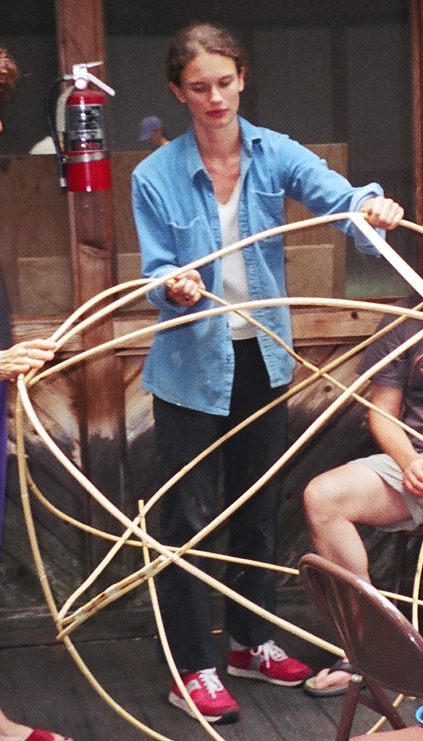 Learn more about Processional Arts Workshop. . .
Fritz and Christa Gaebler (hosts, producers, chef) are proprietors of Casa dei Fiori, and hail originally from Stuttgart, Germany. For 30 years they have made the historic restoration of Morinesio their life work. Christa is a world-class chef, organic gardener, and teacher of culinary arts, and she has owned several successful restaurants in both Germany and the United States. They are currently creating a new retreat in Kerala, India. Learn more about Casa dei Fiori . 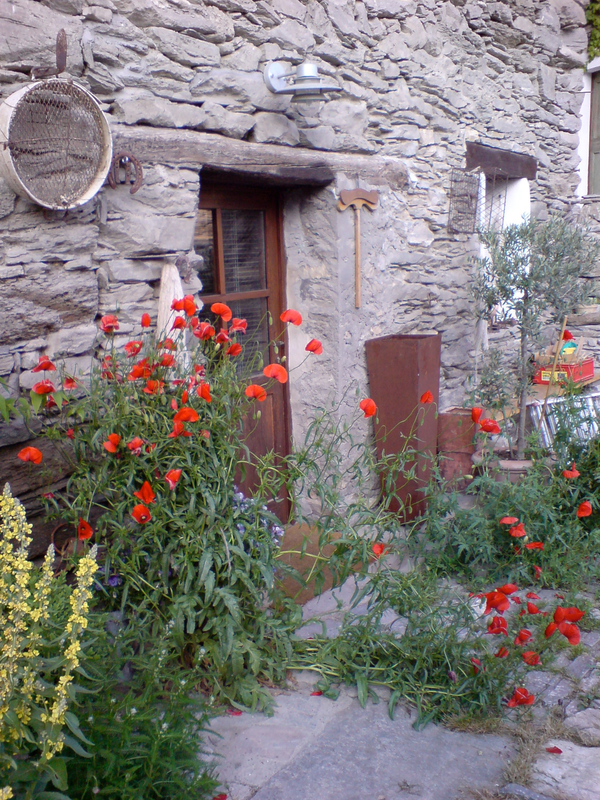 . .
All particpants are housed in the lovely Casa dei Fiori, or in one of the neighboring Morinesio stone farmhouses that have been converted into comfortable guest accomodations with modern conveniences. Participants have their choice of various living arrangements, ranging from luxurious private apartments, to economical but comfortable shared rooms. Prices vary depending on private or shared accommodations, and walking distance from the puppet workshop. Three full meals are served daily, prepared from local, fresh produce by Christa and other local chefs. A highlight of the week is pizza night, a gathering of villagers and participants to feast on pizza baked in the wood-fired oven of the oldest house in the village. Housing and daily traditional breakfast, lunch and dinner. Meals prepared from locally grown ingredients. 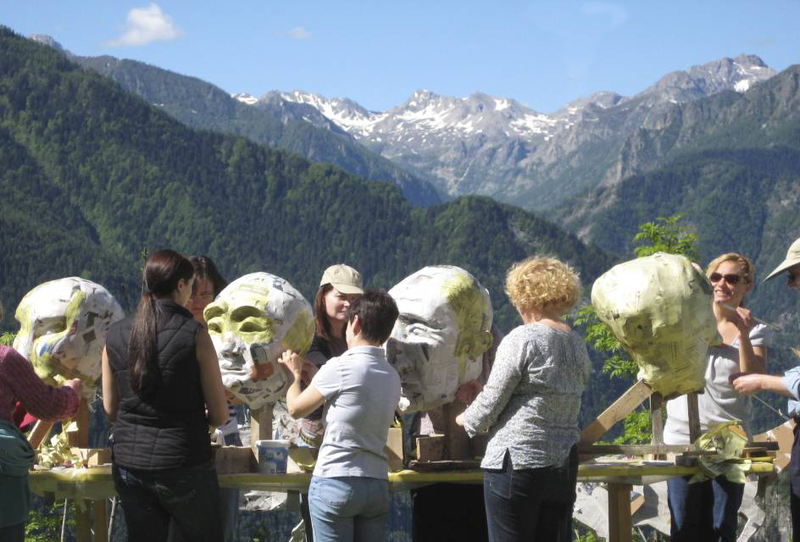 Arrangements are possible for extended stays, in order to fully explore Val Maira region beyond the timeframe of the workshop. Reservations will be accepted until May 1, 2019. To confirm your reservation, we require a 1000 Euro deposit per person (non-refundable). Final payment is due upon arrival at workshop. Payment may be made in either American dollars or Euros and is payable by traveler's checks or personal check to Christa Gaebler. European participants can transfer their deposits directly to the Casa Dei Fiore bank account. Credit cards are not accepted. We reserve the right to cancel the workshop if there is insufficient enrollment. If by May 1, the enrollment minimum of 8 participants has not been met, we will provide you with a full deposit refund. We cannot, however, pay compensation or incur liability for travel expenses or other expenses you have incurred. For this reason we recommend that you acquire travel insurance to refund your airfare if event is cancelled. In the unlikely event that the workshop is cancelled, we offer the option for you to stay at Casa die Fiori at an arranged weekly rate.